Sportswear in France may have a ways to go before reaching the level of other cosmopolitan cities. Nevertheless, Paris does boast some sweet spots that reflect our community’s unique notion of comprehensive wellbeing. Kerzon was founded by two brothers, Pierre-Alexis and Etienne Delaplace, as a place to share their olfactory memories and souvenirs of their grandmother’s house in Brittany through a range of products for body, home and textiles. The range - imagined in Paris and made by hand in France - evokes leisurely days, fresh linens drying in the sun, and intimate conversations in the kitchen just before la sieste. Our favs: the Méga Propre laundry soap, the Roi de Cuir scented votive candle and the Parc des Buttes Chaumont sachets for drawers and suitcases. Apparently the cosmetologist and perfumer Jean-Vincent Bully inspired Balzac’s César Birotteau, the lead character of the eponymous novel and one of the characters in the Comédie Humaine. The Officine Universelle Buly has created products conceived in Paris and formulated in a French laboratory, nourished by modern cosmetic advances while still staying true to certain traditional formulas. A hands-on collaboration between husband and wife team Victoire de Taillac and Ramdane Touhami, the brand has a flagship shop in Paris, with counters and shops in Taipei, Seoul, London and New York. We’re fans of the Eau Triple Berkane Orange Blossom, the camelina seed oil and the opiat dentaire orange ginger clove. With the creation of Oh My Cream!, founder Juliette Lévy has freshened up the French beauty game. She constantly finds new brands and advocates a more accessible discourse that highlights ingredients and their benefits. Since opening in 2012, OMC! has expanded into a retail network of 10 fresh and inviting retail locations and an excellent eshop dedicated to "clean" and more "authentic" beauty. Results: transparent formulas, a comprehensive range with effective products, some very affordable essentials and an attentive, informed and passionate staff. Lately we’ve been loving the facial treatment using Dermalogica, Ren Skincare or Tata Harper products, the Eyelisse by Joëlle Ciocco and the Daily Microfoliant by Dermalogica. Manifeste 011 (11 as in the 11th month aka vegan month) is the 1st 100% vegan-friendly shop in Paris. In light of the disastrous impact that the textile industry has on the environment, twin sisters Judith and Maud Pouzin decided to create a conscious shopping alternative, one with vegan products manufactured under ethical working conditions. The shop also operates according the the most energy efficient means possible. In terms of brands, the selection is wide, with an eclectic mix that includes Wanda boots from the brand Good Guys, sweat pants by Super Market, a green (of course) hat from The Woods and a Paris Happy bag by Magnethik. The Canadian brand Lululemon continues to leave its mark on the hexagon, bolstered by three Paris outposts. After settling in the Marais and Saint Germain in 2015, a third shop followed on Rue Saint Honoré in July 2016. Throughout, the local team hosts a solid regular program of community yoga classes, running meet ups in the Tuileries, and the occasional Kundalini rave. In terms of product, there is no contesting the quality and cut of the sports bras and leggings. We are also fans of both the monotone Taryn Toomey collection - may it provide its wearers with even 10% of the instructor’s natural grace and style - and the brand’s collab with the Saint Martins school: graphically colorful and très British. Yoga Searcher is first and foremost a French clothing brand comprised of pieces made in Europe from natural materials such as bamboo, wool, linen, vegetable dyes and other natural pigments, all with the certification ECO-TEX. There are also beauty products from the South West of France - much appreciated by our French community. The brand’s founder - Bénédicte Péroz - draw inspiration from the Landaise farm in the coastal town of Hossegor, where the brand also hosts yoga and surf retreats. For those unable to make the trip down south, the Parisian flagship provides an entry point to the same effect, the less nature, and the brand has even opened a with a boutique and on site studio dedicated to yoga and meditation (which we talked about here) and with classes in both French and English. Initially launched as the first Nike Sportswear boutique in Europe, this discrete shop on Rue Saint Gervais - housed in what was formerly a bookstore - is now 100% dedicated to the brand's most advanced creations and collaborations, those with the Nike Lab moniker. Shoppers love the human scale, the warm and very Parisian interior, and, of course, the special products like the Gyakusou collection by Jun Takahashi of Undercover, the women’s capsule collection by Parisian label Pigalle, and the technical gear proposed via the outdoor-oriented ACG label. Located just off the Canal Saint Martin for over 15 years, the Boxing Shop has obviously established themselves as the go-to shop for boxing, martial arts and MMA aficionados. Whether gearing up from head to toe or on the market for a 1st pair of gloves, chest protectors or technical shoes, they have it all and for all shapes and sizes. Well, with the exception of the their women's apparel that is still a bit limited. However, given the significant increase in practitioners and practice spaces lately, we’re confident this will soon improve. 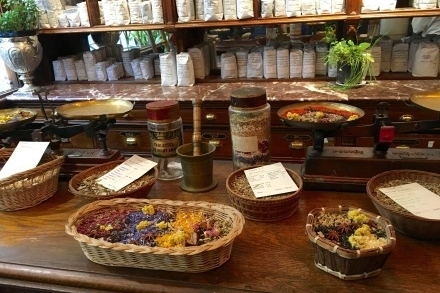 L’herboristerie de la Place Clichy is the oldest herbalist shop in Paris. The apothecary-style shop proposes hundreds of plants, tinctures, essential oils and other plant-based products...resulting in distinctive smell that seduces from the sidewalk. Enter through the yellow door, stepping back into a charming and pertinent mix of old remedies and modern needs. Florist artisan Pierre Banchereau modestly describes his work at Debeaulieu as being inspired by "the influence of Flemish classical painting of the seventeenth century (...), of photographs of flowers by Hans Peter Feldmann, the opulent decor of the Villa Boscogrande Cheetah of Visconti, and Gerhard Richter's work." And indeed, week after week, the windows of the Rue Henry Monnier storefront exude a new form of poetry. Debeaulieu's florists own their distinct style, providing time and time again a recognizable touch to each creation. The compositions are intentionally a bit random, heterogeneous, mixing buds and greens full of personality without ever losing site of the overall balance.